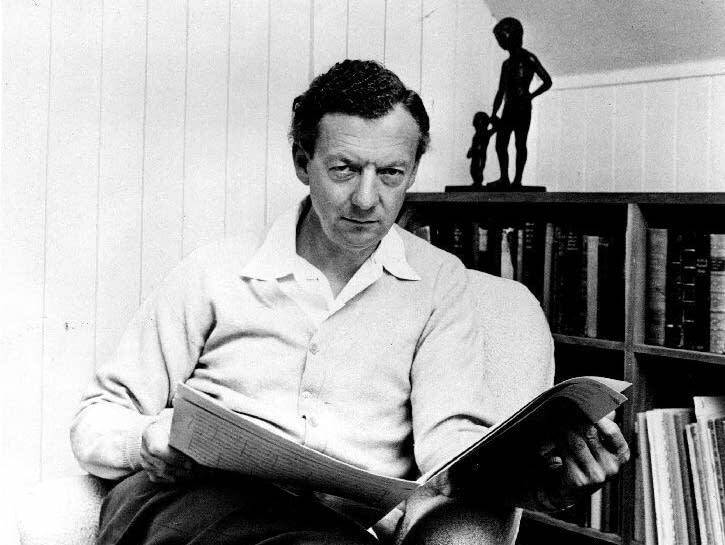 Benjamin Britten was born Nov. 22, 1913. To celebrate the centennial of his birth, we'll hear five works written by the influential British composer for some of his greatest muses. Bridge was one of Britten's first composition teachers, who encouraged Britten to find his own compositional voice (even if it broke ties with decades of tradition). Rostropovich's close friendship with Britten inspired the composition of several works for his instrument; besides this cello sonata, Britten also wrote a Symphony for Cello and Orchestra and three suites for solo cello. The famed pianist Paul Wittgenstein, who lost the use of his right hand in World War I, met Britten in 1940. Diversions was premiered by Wittgenstein in 1942, but was not immediately successful, since many critical accounts of the performance focused on Wittgenstein's astonishing abilities. Welsh harp player Osian Ellis was Britten's go-to harpist. Britten wrote many prominent parts for harp in many of his pieces, including War Requiem and A Midsummer Night's Dream, and frequently involved Ellis in their composition and performance. Britten and poet WH Auden became close friends while working together at the General Post Office Film Unit, writing text and music for documentaries. Auden's poetry inspired many of Britten's pieces, including this celebration of the Patron Saint of Music.